Everyone’s got their own thoughts on this, and to be honest, I’ve seen a few lists that are so crazy different from my own that I thought I’d like to jump in and share! I tend to focus most on whole, natural and organic ingredients wherever possible. Maybe something here will resonate with you too! 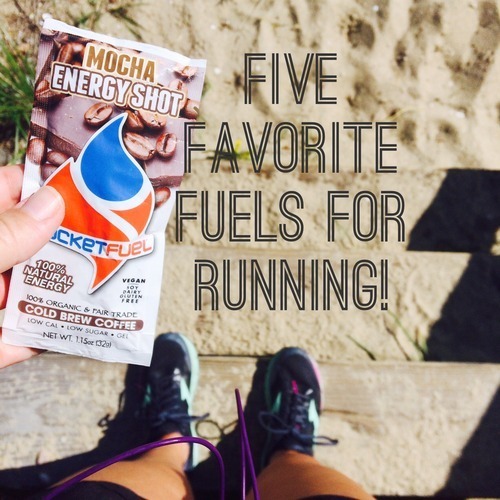 Below are MY five favorite fuels for the long run! (1) PocketFuel Naturals – Harder to find out East (some EMS and REI stores), but increeedible on flavor. These comes in a Gu-like packet, but they’re made from 100% natural, whole food ingredients found in nuts, seeds and fruits. I think Chia Goji & Honey is my favorite flavor. The caffeinated shots are pretty great too! Many are vegan, dairy and gluten free for a bonus! I simply order these online. 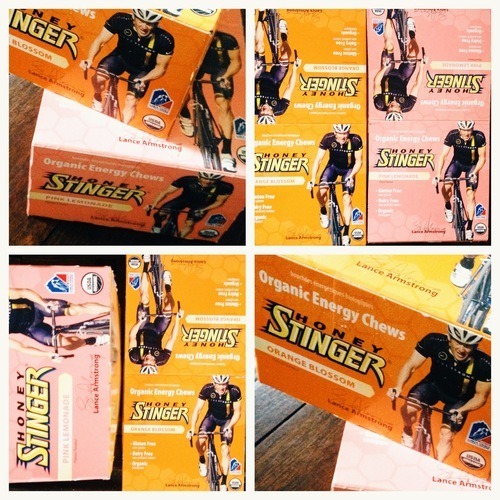 (2) Honey Stinger – I’m a big fan of chewy, fruity blocks, and these ones are the USDA organic kind! The two cases I’m hoarding right now are orange and pink-lemonade flavors. I never finish a whole packet on one run unless it’s over 13-15 miles. Tip: slit the bag to get rid of some air before shoving into your pocket, handheld or belt. Honey Stinger also makes some goops and waffles – yep, waffles for your pocket! (4) Nuun – This one’s actually about WATER, because I sometimes feel like runners love a little too much on the amazing Nuun community. You don’t need Nuun on every run, so please don’t forget the pure joys of water! BUT, other options can be worse, such as Powerade, Gatorade, etc. 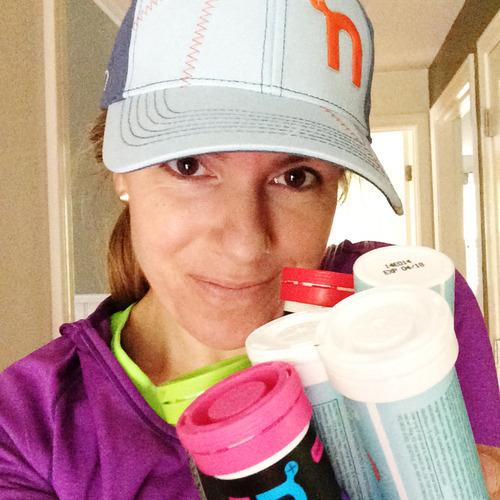 So I’m with ya – I love me some Nuun when I need a boost! Tropical flavor, anyone? (5) Sweet Potato – I’m picking the sweet potato to represent for the entire category of REAL food. Sometimes it’s fun, cheaper, more flavorful, and just as beneficial to have real food on your runs. Cook the whole potato the way you like (bake, microwave, sauté slices), slice it up and add a dash of salt for your sodium fix too! Just slide ‘em into a zip lock bag and bring with you! 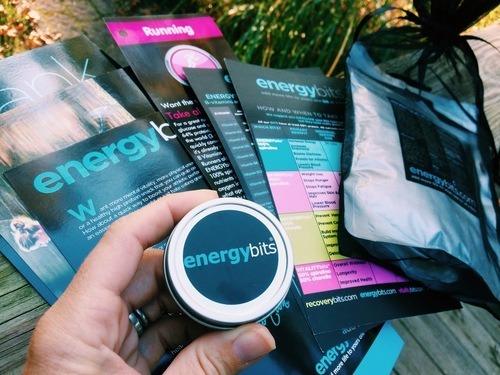 More on real food fueling from Runner’s World here. So those are my top five favorites! These are all things in my house and in my gym bag right now! But do share! What are some of your favorites? Do you agree with my picks, or have some great recommendations for us too? I’d love to hear from you! Check out my pal Courtney’s list this month too, at Eat Pray Run DC! ← In Runner’s World Magazine!